[by Sandy McIntosh] Nehemiah was the great project manager of the Bible. We are told to live by faith, and that is what he did. The repair-Jerusalem project was not possible, and he was the wrong person for the job, but he did it anyway. He was highly motivated, he clearly defined the need, he measured carefully, and then he met the enemies who wanted to kill him. In the six sigma model I refer to here, “what to do” (measuring) precedes “how to do it” (analysis). When he had answers to both what and how, Nehemiah called the people to a meeting and recruited his team. He acted as a leader and brought a plan to the people. There are many models for completing a project, and all the good ones include managing risk. I have met full-time professional risk managers who only plan for the bad stuff. This concept is not popular with Christians. We tend to be all happy and rosy, and when things get negative, we think maybe God is angry. Every Bible story has problems and risks, and we have to manage bad weather and people who hate us, and all points between. You have insurance on your car, right? The danger was so extreme for Nehemiah that he split his project in two; rebuilding the walls, and holding back the enemy. In my neighbourhood, we have the sad siding project. See the picture above. 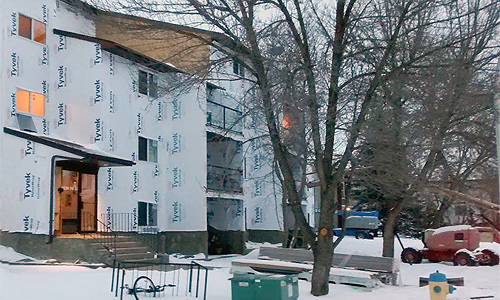 A contractor is re-siding a condo apartment building. Right now everything is frozen, and maybe the work will be done in the spring. What are the chances of winter where I live? 100%, I live in Canada. And on a scale of one to ten, ten being most severe, could cold weather impede the work? 10. We know, someone really messed up on the risk management. November was cold and winter is still with us. That could have been Nehemiah, and it could be you and me. Imagine a very short book of Nehemiah ending with the death of the hero, and the termination of his project. I was on a church board once, and our project was to move from a rented school gym to our own building. We paid a deposit on a piece of land and then the owner decided not to sell to us. We had all the legal papers but we asked ourselves if our church could, or should sue a land owner in court. In this world, what are the chances of a dishonest real estate deal? We managed that risk and now that church has a nice building somewhere else. So what voyage are you contemplating? When you are ready for the storms, you are ready. And please join me as we follow Nehemiah to his impossible success. Maybe it will inspire you. We can only live by faith when we act. Previous PostWas Kim Kardashian’s family saved by a 165-year-old prophecy?